1. Sieve the plain flour and baking powder in an bowl and keep aside. 2. On a double boiler add the roughly chopped dark chocolate and little milk, mix well and melt the chocolate. Keep aside. 3. Combine the sugar and margarine and cream it throughly. 4. Add the beated eggs, vanilla essence, plain four mixture and chocolate to the cream mixture and blend till smooth in consistency. 5. The mixture should be of pouring consistency, if required add little milk. 6. Grease a cake mould with ghee/butter and sprinkle some flour over it. 7. Pour the cake mixture in it and add the walnuts. 8. Preheat the cooker on high flame for 2 minutes, put the cake mould, cover with the lid, without the whistle and let it cook on high flame for 5 minutes than reduce the flame and cook for 40 minutes. 9. The cooker should not have water in it. 10. After 30 min open the lid and check if the cake is cooked by inserting a knife in it. If the knife comes out clear, than the cake is cooked, if it comes out sticky, let it cook for some time. Note: If u do not have margarine you can use unsalted butter for the same. 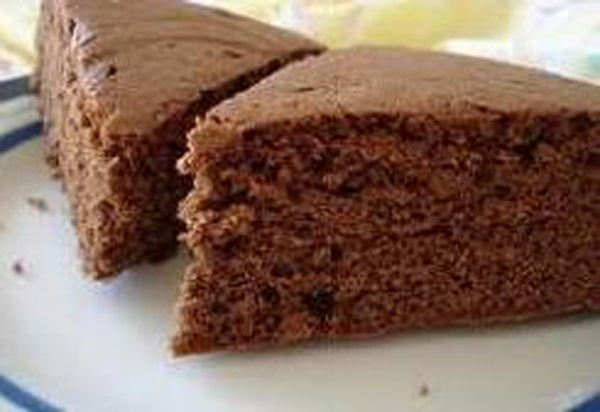 Instead of dark chocolate, you can use cocoa powder, and to make the cake eggless, add 1 cup milk and 1 cup milk powder instead of eggs. This entry was posted in All Recipes by Kamakshi. Bookmark the permalink.